Cube shaped, staight side or box bins fit well in corners of a modern garden and many have larger hatches than the conical bins. This is a bit of a catch all group as some have rounded corners but in most cases the base and top are the same size. 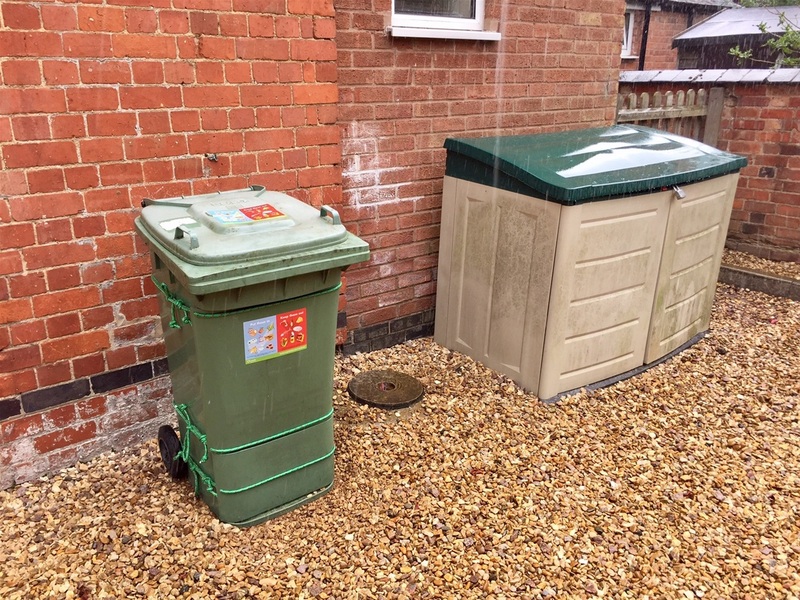 The shape of this type of bin makes it easy to insulated using loft lagging, bubble wrap or even bales of straw to carry on composting during the cooler months. I felt I had to meantion the use of these bags for composting and this seemed to be the right place as they are made of woven plastic and have straight sides. Builders merchants now deliver sand in non-returnable bags made of of woven plastic material which are of a suitable size to act as a free compost "bin". These can be used as a temporary measure at peak times or as a maturation bin. Some support the bags by pushing stakes through the material at the corners, others also cut the base out to make it easier to remove the bag when harvesting the compost. If the bag is used without cutting the base way the front can be cut open when to harvest the compost as the full bag will be heavy and difficult to tip over to remove the finished compost. With the lid removed the material in this bin can be turned easily. 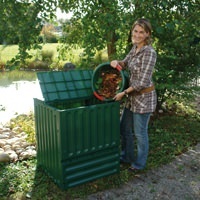 The ThermoQuick is a cube shaped composter with a roundedcorners. It is available in two sizes 400 and 600 Litre. It has air slots to allow air to circulate accelerating the composting process .The lid can be adjusted to stay up by itself and the "lid-grabber" hinges hold the lid in place. 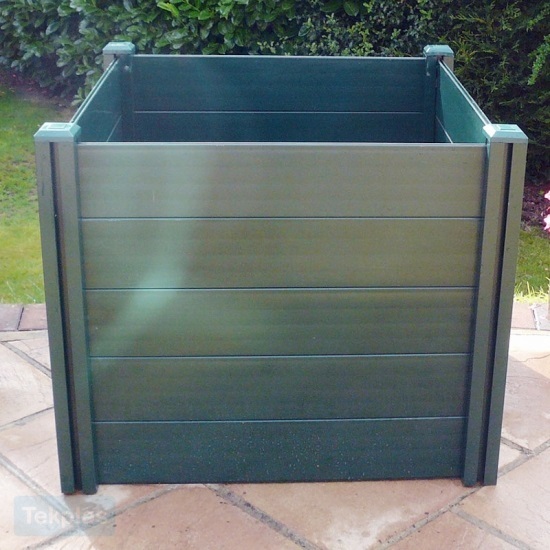 Fitted with good size hatches for easy harvesting Supplied in five easy to assemble panels. 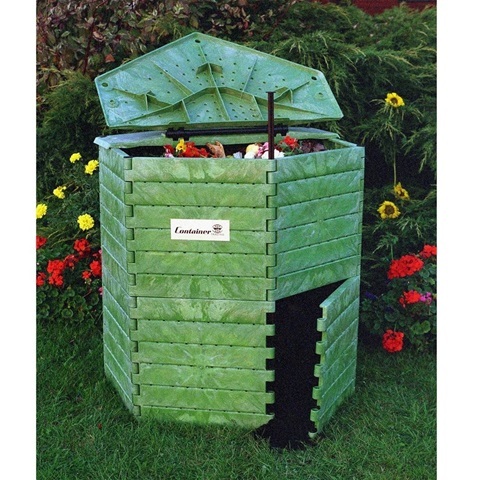 Tekplas Compost Bin 500 Litre capacity. This UK manufactured garden compost bin is made in upvc but looks like a conventional New Zealand box providing a modern twist on the conventional bin that has been used by generations of gardeners. 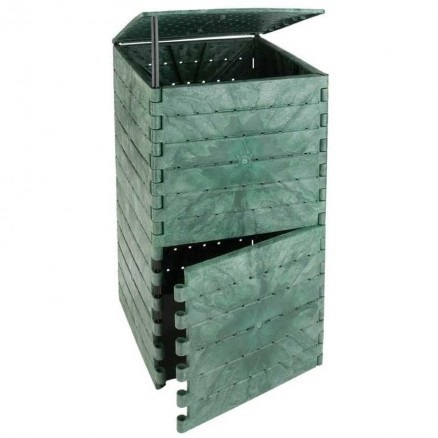 It is supplied with four galvanised steel ground stakes which fit inside the corner posts and brace bars giving stability to the finished bin. The green plastic tongue and grooved twin wall boards provides good insulation which I feel will more than compensate for the fact that the bin is smaller than the conventional 1m cube recommended for wooden bins having 80cm sides. The plastic boards can be removed in the same way as the wooden boards of a traditional bin. “Add ons” are available so that bins can be linked together to make a 2 or 3 bin system. The bin could also be used as a Maturation bin for compost produced using one of the smaller tumbler composters. The Komp Thermo Composters are vertical modular aerated systems manufactured from recycled PE. The bins consist of thick modular panels with ventilation holes to improve aeration. The panels are connected using plastic rods, which can be partially removed to allow a panel to be opened to harvest the compost. There is a hinged lid. The smaller capacity bins have four vertical sides while the larger models have six or eight. The four sided Komp 420 compost bin has conical sides and uses a similar pin system for simple and easy assembly. As with most plastic composters this model is made from recycled material and is available in three sizes 400l, 600l, 900l. Easy filling through a lid with two big flaps. The “Wind-Fix-lid” has summer and winter position to regulate the air circulation and protect against the wind. Faster composting through an optimal aeration system and the foamed thermo walls. These are insulated bins which includes a Moisture Recirculation System and an “Aeration Lung”, an arrangement of cones and tubesriseing from the base through the centre of the compost providing ventilation avoid the need to aerate the compost by turning . It is also has a Leachate Reservoir which collects liquid run off and can be used as a a liquid fertiliser when diluted approximately 20 parts water to 1 part leachate. The bins have two removable large doors making harvesting easy although you do have to work round the Aeration Lung. I have used an Aerobin 400l for a number of years and have been impressed by the build quality. RIf you have more waste and a larger garden the larger Komp Thermo Compost Bin the Komp 700 may be more suitable. This six sided 700 litre compost bin has the Komp easy assembly pin system forming a has flat sided bin with a hinged lid. Like the Komp 250 the bottom panel swings open one of rods are pulled up. A 200litre insulated hot composting bin reaching temperatures of between 40-60°c breaking down waste into compost in 30 – 90 days killing pathogens and weed seeds as a bonus. 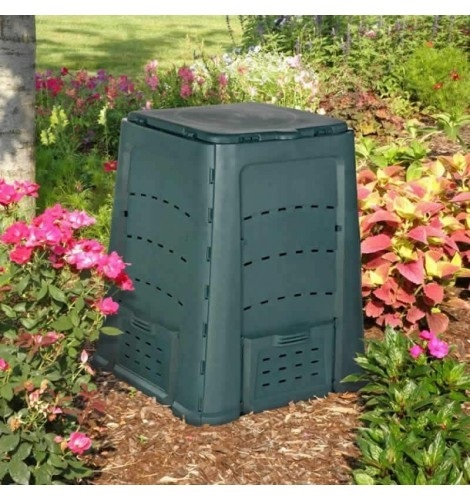 The composter provides all year composting of food, including cooked food, and garden waste with the addition of bulking agent to the mix to keep the air flowing inside the bin. 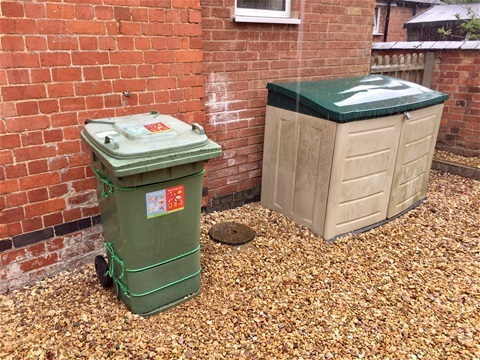 The bin is shaped like a wheelie bin having a large hinged lid and a large panel for ease of emptying. Thermometer and filter are also available. A bin can be seen in use at Compost Demonstration site page. Photos of the compost being harvested are on other pages of this site. The Biolan 220 is designed for year-round composting of kitchen waste from a household of 1-6 people. It has a thermo-insulated structure and the efficient ventilation system. There is an adjustable valve for ventilation and a patented ventilation system. The shape is designed to return the condensed moisture to the composting material. Easy filling through a large flap lock . The cover also has an adjustable air valve. The dense structure and adjustable ventilation helps retain the moisture content strongly built, enables ot withstand variations of weather and frost. An aluminium mesh base basket is available to prevent access by rodents and provide ventilation. 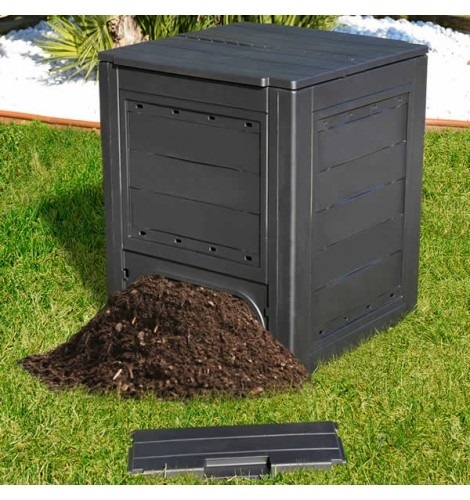 The 450litre Stone Composter can be used for composting garden and household waste. The Stone Composter due to its rock colour and texture will blend into the garden environment and can therefore be used even in a smallish garden. It Accepts food, garden waste and animal waste and is insulated for all year composting Large hinged lid. In the past it was quite common for councils in the UK to provide a free green waste collection service to householders. This kerbside collection of garden waste used wheelie bins provided by the council. As a result of the cuts in funding many councils have now introduced a charge, typically between £20 and £50, for this collection. While the take up of this paid for collection is normally sufficient to provide the council with an additional income source a significant number of householders have opted not to participate in the new service and now as the council if the council does not intend to collect the non redundant wheelie bin taking up space in the garden. These can easily be converted into compost bins if the council will not collect them or pay you rent for the space they occupy. Before starting the conversion it will be necessary to decide whether you will want to harvest the leachate (liquid produced during the decomposition of the waste) or whether the leachate is to be allowed to drain away. The simplest conversion where the leachate is allowed to drain away will require drainage holes to be drilled in the bottom of the bin. This will also allow worms to enter the bin from the soil. In addition I would recommend that a three or four rows of holes be drilled just below the lid to provide additional ventilation. Additional rows can also be drilled halfway down the bin. To make the hatch, for the removal of the finished compost using a garden spade, neatly cut out a rectangular section from the front of the bin near the base. Make it as large as possible using the flat surface between the raised corners. Ideally the lowest cut should be level with the base inside the bin. The piece of plastic removed can be refitted with by hinges at the top and with a bolt at the bottom to make a hinged hatch. A small self adhesive hook can be stuck onto the bin above the fitted hatch so that it can be tied open while compost is being removed. If the leachate is to be harvested add a tape near the base fitted to a plastic tube so that the liquid can be drained into a container and diluted for use as a liquid feed. In this case the bin is best mounted on a couple of breeze blocks to raise the height so as to make drainage easier.